T his book is a distillation of nearly 40 years of martial arts experience. At the end of the 50s, the author began to study various western and eastern martial arts including freestyle wrestling, pro-wrestling, Jiu-Jitsu, judo, Kempo and Shaolin Kung Fu. These were followed by Shotokan and Wado-Karate, Kobudo (weapons), Tae-Kwon-Do, Aikido, the Thai martial arts, Escrima (Philippine stick and knife-fighting), Bruce Lees non-classical Kung Fu and the Leung Ting system of WT, which experts consider to be the most practical and effective self-defense system of all. Today Professor Keith R. Kernspecht (National Sports Academy and State University of Bulgaria) is one of the most highly graded WT-masters in the world, the WT-Chief Instructor for Europe and Coordinator for the Western World. He has established the Leung Ting-System of Wing Tsun in all European countries on behalf of the IWTA in Hong Kong. With a current total of more than 1,800 associated schools in Germany, Austria and Switzerland alone the EWTO the Western section of IWTA founded and led by the author, is the worlds largest professional martial arts association. Since 1982 the association has published its own magazine, "Wing Tsun Welt" (Wing Tsun World). "On Single Combat" is the 9th specialist book on the martial arts to be written or published by Keith R. Kernspecht. 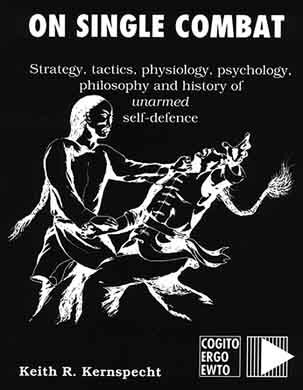 It is probably the very first comprehensive treatise on the phenomenon of individual combat, including aspects such as strategy, tactics, psychology, physiology, law, history, and philosophy, and undertakes to show how the complex processes occurring in a combat situation dictate the reactions of a defender and therefore circumscribe his actions. Only very few books concern themselves with the theory and concept behind a style, or with fighting skill per se. Reversing the definition by Clausewitz which states that war is an extension of individual combat, the author attempts to view individual combat as an element of war and examine whether both are subject to common laws. Further parallels are drawn from the Asian philosophies, chess, tennis and team games such as football and rugby. The knowledge and experiences of highly-successful wrestlers, boxers, karateka, special police units and notorious street-fighters are compared with his own 40-years experience as a martial artist, power-lifter, police officer, university-professor , bodyguard and visiting instructor to international elite police units such as the FBIs Hostage Rescue Team (USA), SEK and GSG9 (Germany), RAID (France), NOCS (Italy), SEK Cantonal Police, Zurich (Switzerland) and GIP (Luxemburg). The author takes a critical look at the real combat value of the conventional martial arts and self-defense methods, and is not afraid to slaughter a few sacred cows in the process.